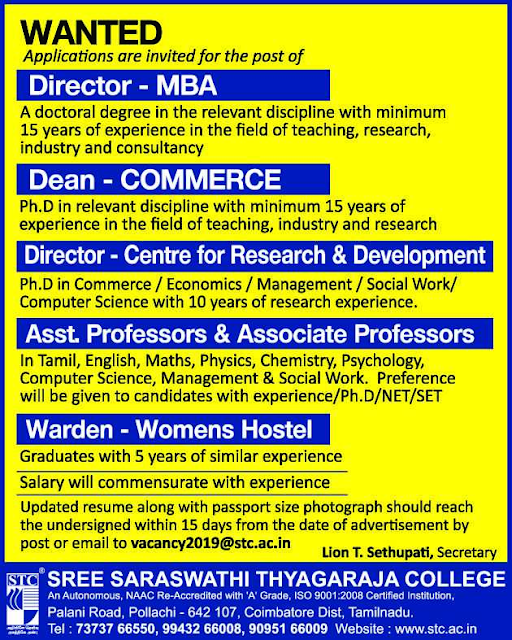 Looking for Assistant Professor jobs in Arts & Science Colleges 2019 in Tamilnadu? or Searching as Faculty Teachers Tamil Nadu April 2019? A college based in Coimbatore named Sree Saraswathi Thyagaraja College, Coimbatore has advertised in THE HINDU newspaper for recruitment of Associate Professor / Assistant Professor / Director / Women's Hostel Warden jobs vacancies. Interested and eligible job aspirants are requested to apply within 15 days from 10th April 2019. Check out further more details below. About College: Established in the year 1997, Sree Saraswathi Thyagaraja College is a co - educational, self-financing institution that seeks to impart value-based education and training to help the students to measure up to the demands of a highly competitive environment. The College is affiliated to Bharathiar University and the MBA and MCA programmes offered at STC have been approved by All India Council for Technical Education, New Delhi. Set in sylvan surroundings, the College ensures that the students learn in a conducive academic environment with the state of the art infrastructural facilities.